Washington, DC is a great place to explore with kids. With so many choices of things to do in the region, here are my top suggestions for children of all ages. Zoological Park National - One of the most kid-friendly places to visit in Washington, DC is the National Zoo where you can see more than 400 different species of animals. The National Zoo is set within the beautiful Rock Creek National Park and is a part of the Smithsonian Institution. Admission is free! Daily programs at the zoo include animal training, feeding demonstrations, and keeper talks. To see all of the animals and exhibits at the National Zoo takes several hours. You should pick up a map and plan ahead so that you don't miss any of your family's favorite animals. 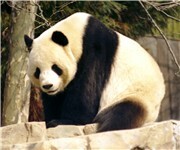 Among some of the favorites are giant pandas, other bears, lions, giraffes, tigers, monkeys, sea lions, and much more. Visiting the National Zoo involves a lot of walking. You should dress appropriately for the weather and wear comfortable shoes. To avoid crowds, arrive early in the day or after 2 p.m. Weekdays are usually less crowded than weekends, and fall and winter are less crowded than spring and summer. Smithsonian National Museum of Natural History - The National Museum of Natural History is a favorite with kids, but has plenty to intrigue all ages. Popular displays include dinosaur skeletons, an enormous collection of natural gems and minerals, artifacts of early man, an insect zoo, a live coral reef and much more. The National Museum of Natural History is part of the Smithsonian Institution and houses a national collection of more than 125 million natural science specimens and cultural artifacts. This museum is also a research facility dedicated to inspiring discovery about the natural world through its exhibitions and education programs. At this favorite Smithsonian museum, kids enjoy examining a wide variety of artifacts including an 80-foot dinosaur skeleton, an enormous prehistoric white shark, and a 45-and-a-half carat jewel a known as the Hope Diamond. The Discovery Room is a great hands-on display for young children. Feel the skin of a crocodile, examine the jaws and teeth of different animals or try on clothes from around the globe. Smithsonian's Discovery Theater - The Smithsonian's Discovery Theater is a live theater geared towards children. Classic stories and folktales are told through puppet shows, storytellers, dancers, actors, musicians, and mimes. Performances are open to the public. Advance reservations may be arranged for school groups, youth organizations, and families with children. The Smithsonian's Discovery Theater, located in the Ripley Center on the National Mall in Washington, DC, is a live theater geared towards school-age children. Classic stories and folktales are told through puppet shows, storytellers, dancers, actors, musicians, and mimes. The Discovery Theater also presents shows at The Round House Theater in Silver Spring, MD and Baird Auditorium in the Natural History Museum. Glen Echo Park - This wonderful park near Bethesda, Maryland offers year-round activities in dance, theater, and the arts for the adults and children. There are concerts, demonstrations, workshops, and festivals. The antique Dentzel carousel delights children May through September. Enjoy a puppet show at the Puppet Co. or a children’s theatrical performance at Adventure Theatre. At Discovery Creek Children's Museum, explore nature, history, and the arts through innovative educational programs and exhibits. Glen Echo Park was established as a Chautauqua retreat in 1891 and was a premier amusement park serving the Washington, DC area from 1900 until 1968. Since 1971, this National Park has served as a vibrant arts and humanities center managed by the Glen Echo Park Partnership for Arts and Culture. The Park presents year-round activities in dance, theater, visual arts and environmental education. 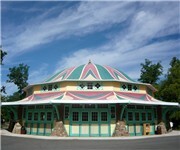 Among the most popular activities at Glen Echo Park are weekly dances in the Spanish Ballroom, performances by the Puppet Co. and Adventure Theatre, programs sponsored by Discovery Creek Children's Museum, and special events such as Family Day and the annual Labor Day Art Show. The antique Dentzel carousel (dating back to 1921) is open May through September. Wolf Trap Farm Park - Wolf Trap Foundation and the National Park Service present 70 performances from late June through early August at the Children's Theatre-in-the-Woods in Vienna, Virginia. Family-friendly performances, including music, dance, storytelling, puppetry, and theater are held at 10 am and 11:15 am, Tuesdays through Saturdays. Wolf Trap National Park for the Performing Arts hosts a wide range of concerts including pop, country, folk and blues, orchestra, dance, opera. Wolf Trap holds performances and offers educational programs all year long in indoor and outdoor venues. Special family-friendly performances are held from late June through early August at 10 and 11:15 a.m. on Tuesdays through Saturdays. Music, dance, storytelling, puppetry, and plays are geared towards school aged children.